These chicken parcels have an exciting tang to them and make a great healthy meal anytime of the year. Remove the peel from the lemon and dice the flesh into small pieces. 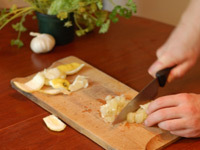 Finely slice the garlic, chop the parsley and mix in a bowl with the lemon, salt and pepper. 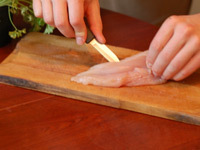 Carefully slice each of the chicken breasts length ways to create a small pocket. Try not to slice all the way through so the pocket can be sealed up once the lemon has been put inside. Stuff each of the breasts with a generous helping of the lemon mixture then seal the pocket with a cocktail stick. 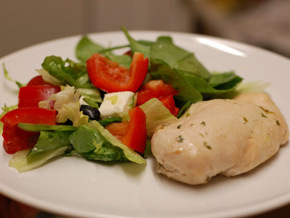 Place the breasts in an oven proof dish, cover with foil and cook for 30 minutes at 190°C/380°F/Gas Mark 5. Then remove the foil and cook for a further 5 minute to allow the breasts to brown off. Serve with a crisp salad.